Some of you may remember the original Castle of Illusion from your childhood like myself. It was a fantastic platformer that I used to play with my brothers, so I had to buy this remake in an instant to see it my nostalgia was warranted. This week, I take a look at Castle of Illusion, a remake of the original Disney game that came out for the Sega Mega Drive (Genesis for those American readers out there!). I loved Castle of Illusion as a child, huddled around a small CRT TV with my brothers taking in all the games gloriously smooth animations and lovingly crafted graphics was one of my favourite things to do when I was 8. The game was difficult for how young I was, but my determination and countless hours of gaming allowed me to preserver and finish this hard game. The platforming involved a lot of memorisation and pin point accuracy, making it one of my favourite accomplishments of my youth. Has Sega Studios Australia succeeded in reimagining what I hold so dear from my childhood? Or is this a shameless money grab from an ailing company looking to cash in on our naivety? The hub world is a nice level which allows you to see all your collectibles in gorgeous 3D, building the world up as you progress. The game is still linear, but the freedom to go back to specific levels that you may want to retry is welcomed. The game starts off 2.5D, showing a 3D Mickey, moving across a 2D forest on his way to the castle where Mizrabel has imprisoned Minnie in the hopes of stealing her youth and beauty. After a little bit of platforming, you finally reach the castle, where you are then taught that the game isn’t 2D at all, and you in fact have to walk into the background to progress the game. Some reviewers have likened this to when the Wizard of Oz was revealed to be in colour rather than black and white, and whilst I like that sentiment, I don’t feel this is as grand a gesture as they’re making out. It’s cool, don’t get me wrong, but when the market has been saturated with 2.5D platformers for years, this doesn’t come as surprising. Once the game is completed, the castle acts as a hub world, allowing you to replay any level you want in order to find all the collectibles the game has to offer, or to play each level as a time attack trial. Each level has plenty to explore, with secrets and hidden collectibles scattered aplenty. Its enjoyable enough to go back to a level to try and find everything, because you certainly won’t collect everything the first time round. 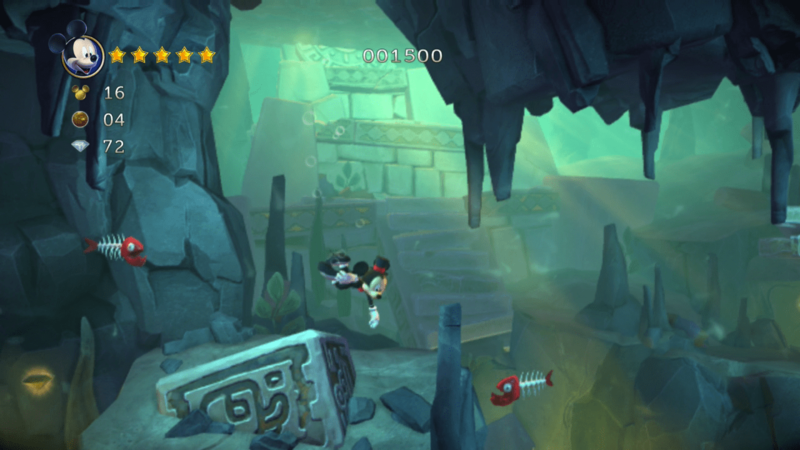 Unlike most water levels in platformer games, the water levels in Castle of Illusion are fairly enjoyable as you don’t have to worry about Mickeys air intake. It allows you to get on with the level and dodge enemies like normal rather than having a constant worry on your mind. The landscapes and design quality of each world is staggering, with a sense of polish you don’t often see in platformers. It reminds me of Deadlight that I played last year (without the same realism and dread that came with a zombie apocalypse), and has a lot of things going on in the background, keeping you entertained and entranced throughout your entire play through. Toy Rockets will take off and land in the background on the toy level, whilst the library will show off deep vista’s, awe inspiring for a fantasy platformer. Gameplay and levels haven’t changed much from the original, with enemies dying as you jump on their head or you can throw an object at them (objects differ per level, from marbles on the toy level to candles in the castle, it sticks to the theme). Most of the game takes place on a 2D plane, allowing you to accurately land on platforms as your progress throughout the campaign. 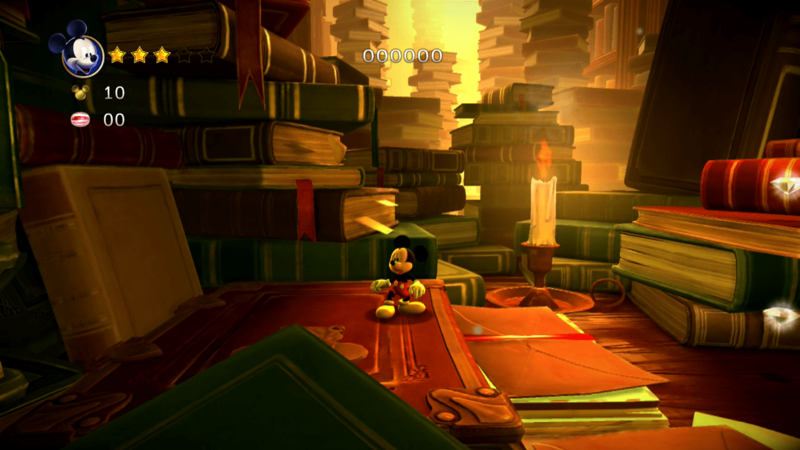 There are a few new features where you’ll jump on platforms in a 3D section, but this is easily where the solid gameplay falls apart, with the shadow showing where Mickey is in relation to platforms frequently disappearing under the different hues of the world around him. These sections are thankfully few and far between, so these frustrations are kept to a minimum, but it’s still a nuisance that Sega Australia managed to make a fairly consistent game so frustrating at times. The level designs are spectacular, despite being simple to navigate. Things are always happening in the background, from books jumping around, to toys flying, the levels conjure up a backstory of a living world rather than being static levels for Mickey to progress through. Boses are a hit and miss, being nice set pieces that show off the engines ability to natively render both 2D and 3D gameplay at the same time, but mostly consist of doing the same dodging until you’re able to jump on the enemies opening. The engine changes from 2D to 3D platforming can be a little jarring when you’re trying to avoid an enemy around an entire platform and then all of a sudden the game restricts you to just moving left and right, but as with the annoying 3D platforming sections, these moments are rare, so they shouldn’t spoil your enjoyment too much. 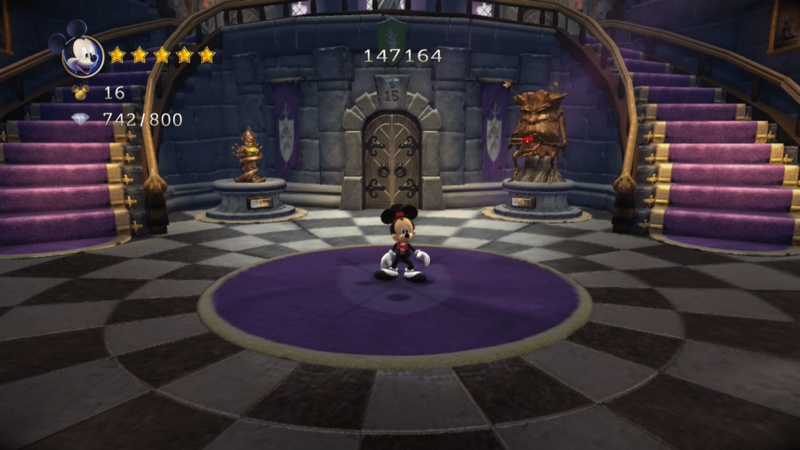 Playing Castle of Illusion took me back to my childhood like I never imagined a game could. It succeeded in keeping my nostalgia in check, whilst also keeping the game entertaining enough to continue on gameplay alone, and not riding my nostalgia. I kept coming back to the game even after completing the main campaign, and although I didn’t get every gem in the game (there’s 800 to collect), I managed to find every collectible before growing bored. 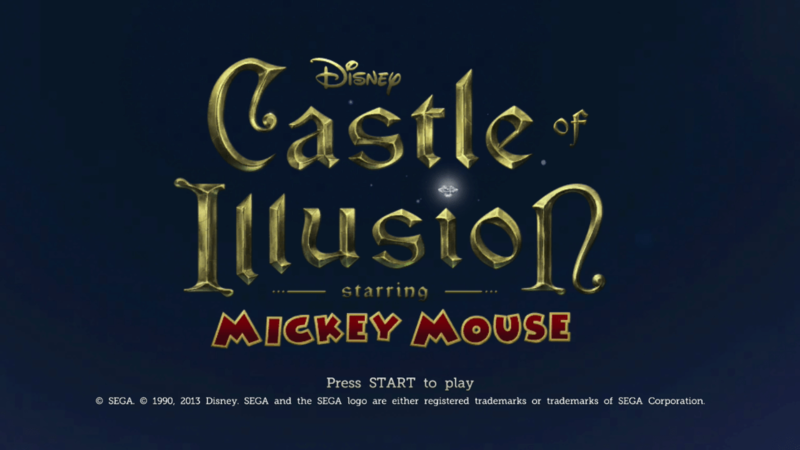 I hope Sega Australia get the chance to remake some other beloved games of my childhood, as I feel a co-operative castle of illusion 2 featuring Donald Duck would be amazing and well received, maybe even fixing some of Castle of Illusion’s set backs.